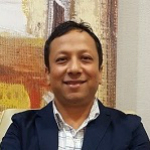 Upendra Sapkota has more than 15 years of professional experience in the field of urban planning, design and community development. In his current role, he is actively involved in the formulation of neighborhood development and economic development strategies. His work in the City of Newark focuses on creating strategies and redevelopment plans for neighborhood revitalization, urban design, and sustainable and equitable development. He has worked on several retail and neighborhood revitalization projects in New Jersey and Maryland. As a planner, Mr. Sapkota is interested in placemaking, urban design, community development, and social inclusion and diversity. He has been involved in various planning and development projects nationally and internationally, including in Haiti and Nepal.